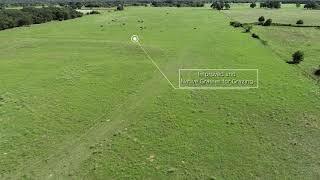 Family farm acreage with home, livestock fencing and hay production. Sandy soils with improved and native grasses for grazing. Fenced and cross-fenced, holding pen, 30x42 3-sided hay barn, two stock tanks. Some hunting. 1400 sqft home with wraparound porch surrounded by beautiful, mature hardwoods. Open concept design, 2BR 1.75BA, nice sized closets, laminate and carpet flooring, stone fireplace plumbed with propane. Co-op water. Separate shed includes 30x30 man cave, livestock stalls and tack room. From Hillsboro, TX. Take Hwy 22 west for 7.5 miles. Turn right onto FM 3050, and then right onto County Road 1321. Property will be on the right.